An Iceberg order executes a large quantity into smaller disclosed orders. When one disclosed portion fills, the next portion is sent to the market. This process continues until the order is filled. You may set a variance percentage so that the quantity of each disclosed portion is different. The following screen shots illustrate an Iceberg with a goal quantity of 500 and a disclosed quantity of 50. The variance percentage of 20 discloses child orders into the market with individual order quantities randomized between 40 and 60. The following screen shot illustrates a native Iceberg with a goal quantity of 500 and a disclosed quantity of 50 placed in MD Trader. The Synthetic SE submits a child order (line 1.1) to the market with a working quantity of 50. The parent order (line 1) displays a working quantity of 50 and an undisclosed quantity of 450. The synthetic SE continuously monitors the order for fills and will not release the next child order until the 50-lot is completely filled. If the order is n<1, it rounds up to 1. If the order is <n.5, it rounds down. If the order is >n.5, it rounds up. Note: Refer to Price Mode for more details about this topic. Click the Advanced Settings drop-down and select Iceberg. Set the Disclosed portion viewable to the market. This is either a percentage of the total goal quantity or a fixed number. Note: Click the % button to toggle between % and Qty. 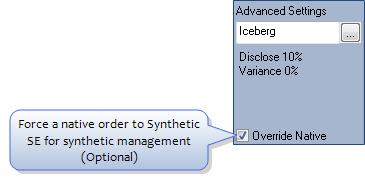 If this is a native Iceberg, click Override Native, if you want the order to be managed by the Synthetic Strategy Engine. 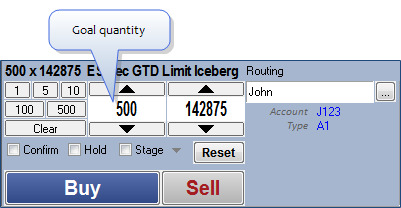 Enable ICE (Iceberg) and set the Default Disclosed Quantity in the Enable Order Types section on the MD Properties | MD Trading tab. 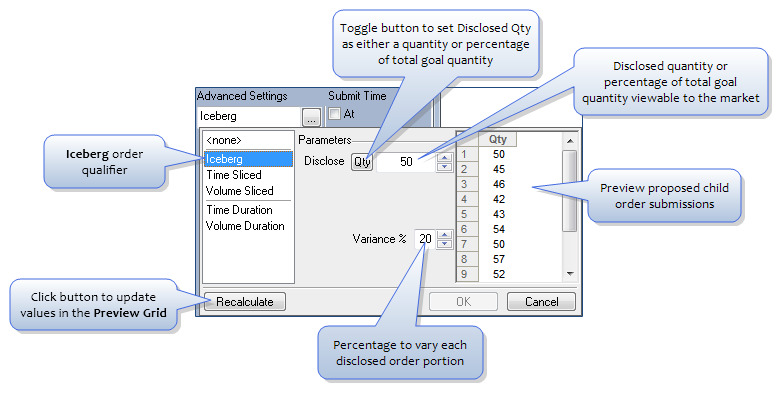 From MD Trader, select the Iceberg order configuration. 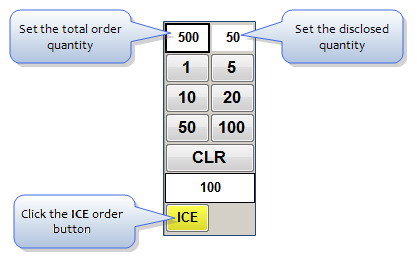 Select the Iceberg configuration in the Order Type drop-down list.